These 3 schools will participate in health and sanitation promotion activities including school to school competitions, learning hygiene practices through traditional music drama and dance along with educational materials such as colouring books and posters. Training and coordination meetings with teachers, local councillors and school management committees will support ongoing health and hygiene curriculum for these schools. Construction of 2 school latrines + 1 more if we reach our funding goal! The site of the well will be identified through a hydrogeological survey and meetings with the schools and neighbouring communities. Plans will be developed for a future projects if more wells are needed. In addition to water access, school latrines are in great demand! Two latrines were initially planned for the project however our goal is to raise enough funds to include a 3rd latrine so that all three schools will have new latrines. In addition to the primary activities in the Ashanti Region, there is also a new special project to take place in the Volta Region to the east. This special project will provide a rainwater harvesting system for Liati Agbonyra Secondary School. Over 300 students attend the school with approximately 40% of students being female. While primary and junior schools are in the area, the only other secondary school is 5km outside of the Liati Traditional Area. Latrines have already been constructed for the school and many surrounding households and neighbouring primary schools already have rainwater harvesting tanks. Liati Agbonyra Secondary School remains in need of water! Ryan’s Well, ARUDMO and participating School Challenge Schools will provide water access for Liati Secondary School for students to have sanitation, water and brighter outlook for their secondary education! Thanks to the commitment and enthusiasm of the following schools, fellow students in Ghana will be gaining access to safe water and sanitation while learning the importance of hygiene and health! Holy Trinity Catholic Secondary School, Cornwall, ON. Henry Anderson Elementary School, Richmond, B.C. F.W. Howay Elementary School, New Westminster, B.C. New Brunswick Community College, Moncton, N.B. April 9, 2013 Ashanti Region As of March 18 – just in time for World Water Day on March 22 – the School Challenge project activities in Ghana were completed. Students and teachers of Ntinanko, Abodom and Poano schools have had a busy few months of learning about handwashing, creating murals, poster contests, hygiene quiz competitions and so much more. A well was constructed for Poano school with the other two schools already having water sources. Latrines were constructed at all three schools – a huge step forward to encourage school attendance, especially by girls. Each latrine was equipped with a small rainwater harvesting tank with a tap for handwashing. The School Hygiene Quiz was a great way to engage students and ensure to put their new hygiene training into practice. 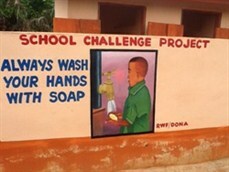 Poster campaigns were especially fun for students as photos of the students take by our partners at DONA were used in the posters – students could see themselves in the posters practicing handwashing. Murals were another opportunity for students to get creative! In addition to activities with students and teachers, important steps were taken to develop Facility Management Plans. Each school has taken time to hold meetings with stakeholders including the Ghana Education Service, Bekwai Municipality and Amansie-West District Assemblies in order to establish the Facility Management Plan. These plans can then be monitored by each of the stakeholders to ensure new latrines and the well constructed at Poano will be maintained and managed properly – another step towards sustainability of water and sanitation. Over the last few months, 1962 students and 61 teachers were active participants in each of these important learning activities. Gaining awareness and practice of handwashing and good hygiene practices will support healthier school environments. Safe and private latrines will benefit students daily life at school, especially for girls. The new well at Poano school fulfilled an urgent need for water supply at this school. All in all, the School Challenge Project in the Ashanti Region of Ghana will truly change lives by improving attendance and results at school and creating a healthy environment. January 31, 2013 Volta Region – A rainwater harvesting tank was installed adjacent to Liati Agbonyra Junior Secondary School. Both students and residents of the community helped with the installation and construction needs for the base of the tank. With the help of volunteers from Project Trust, a non-profit GAP year organization from Scotland, teaching seminars were held for students on the importance of hygiene, proper sanitation and handwashing. The rainwater harvesting system provides a secondary water source for the school. During the rainy season, it is a vital on-site source of drinking water and for hygiene uses. There remain water supply challenges during the dry season however, when managed properly rainwater harvesting provides water supply well into the dry season. Overall, rainwater harvesting provides a water source and a teaching aid as students learn about safe water supply, hygiene and conservation. Thanks to the Project Trust GAP Year Students and partners at ARUDMO! 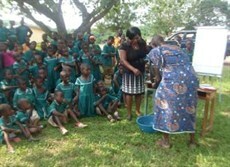 December 7, 2012 Our partners in Ghana have been busy getting projects started since early October. A visit from Ryan’s Well Board Member, Bruce O’Callaghan, and Executive Director, Jane Baird, also in October allowed for lots of discussion about the School Challenge Project this year. Launching the School Challenge! DONA, our local partners in Ashante region, have focused on engaging the three schools and all stakeholders in the area including chiefs and elders, assemblymen, parent teacher associations, headmasters and teachers, school children and community members. Coordination meetings were held to introduce the project activities, Ryan’s Well and our participating schools. After the introductory meetings, an official launch ceremony was held at each of the three schools from Nov. 20-23. Participants were excited for the project particularly about the fact that students in Canada and abroad are donating to sponsor the project! They even want to urge Ghanaian students living in the cities and high income families to also emulate this and get involved in the rural communities of their country. Learning About Handwashing Handwashing stations have been put in place at each school. This includes a water barrel with a tap on a stand with soap and drying cloths. A handwashing demonstration saw everyone get involved – it was important for the students and community members to also see the Chief take part so they understand his support and encouragement of handwashing! The first training workshops also took place at the end of November led by DONA staff members, Claudia, a gender, health and hygiene specialist and Richard, a community mobilization officer. Over 2,700 people took part in the training throughout the 3 schools! This is an enormous amount of people to train but there was much interest in gaining this knowledge of good hygiene, health impacts of bad hygiene and school-related WASH issues. Latrine construction at Poano, Ntinanko and Abodom is also underway. It was also determined that the latrines need to be 6 stances (or 6 toilets) each instead of 4 stances as originally planned. This will help to serve the large populations at each school.